Shirley Wood has spent the last 65 years living exactly like any other Chinese housewife - well, almost. When Shirley Wood, 86, moved to her Chinese husband's homeland from the United States to become a housewife 65 years ago, it was the beginning of a grand adventure. 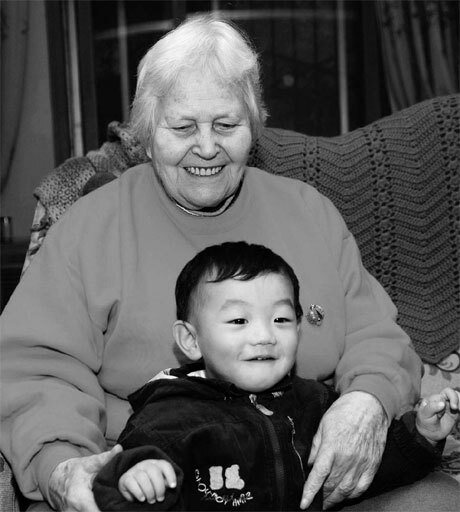 Shirley Wood, 86, with her great-grandson, lives the life of a local in her home in Kaifeng, Henan Province. While quiet domesticity isn't usually the staging ground for excitement, it was the relatively alien character of the culture in which she immersed herself that made it magical. Then, as now, it was rare to see an American woman living a completely native life in her two-story home in Henan Province's ancient city of Kaifeng, where she moved 57 years ago. "Living as a housewife in China has allowed me to better understand the country," Wood says, in the local dialect. "Kaifeng is my home. Life is comfortable here." She says the city has retained its traditional appeal amid its modernization. Part of this is the sense of community, says Wood, who spends much of her time chatting with elderly neighbors. "Here, if you live on a street for a while, you are already a 'lao da jie (old sister)'," she says, smiling. "That's what I like about China. You never feel lonely because people are friendly." But Wood has done more with her time than just look after her family and make friends with neighbors. The retired Henan University language professor - more often called by her Chinese name, Wu Xueli - has devoted herself to education, translation and communication between China and the West. She has written about China for Western newspapers and publishers for decades. Her publisher called her first novel, A Street in China, which was released in 1958: "A picture of everyday life in Communist China by an American who lives the life of a Chinese housewife and mother". She was also invited to translate the premier's and vice-premier's reports at the Seventh Session Meeting of the National People's Congress in 1988. "It was much less interesting than literature translations," Wood says. "There was a lot of political language. Those words sounded nice in Chinese, but got a little awkward when translated into English." She says it became trickier to find precise translations for terms that appeared after reform and opening-up. Some of her word choices became international standards. But Wood's greatest passion has remained education. She spent more than half a century as a teacher witnessing the transformation of China's pedagogy. The closeness of student and teacher relationships impresses her most, she says. "Here, teachers are the students' parents away from home, and the students are very considerate of their teachers," she says. Wood recalls the conditions for education were dire when she first arrived. Many of her students were from the countryside and had never studied foreign languages. The oral English teacher used myriad methods to make her classes more fun, such as games, storytelling and outdoor activities. She recalls spending part of the semesters during the Great Leap Forward digging ditches and cutting wheat in rural areas. "The rests and mealtimes provided good opportunities to speak a little English," Wood recalls. "I would then begin to tell my students some stories." She recalls life wasn't easy when her husband took a job in Kaifeng's suburbs. They had to walk for an hour along a dirt road to reach the city gate. Before moving to Kaifeng, the family had spent several years in Shanghai and Shaanxi's provincial capital Xi'an. "The biggest differences for a housewife are always related to the kitchen," Wood says. Their suburban home lacked running water. So, they had to fill a large water canister bucket-by-bucket. And they had to mix loose coal with clay to heat the stove. Wood had to sew most of her family's clothes, because there were few manufactured garments available for sale. "At that time, people's ideas about their living standards were simpler, and they could make do with fewer conveniences," Wood says. She recalls her youth, while her great-grandson sits on her lap. Wood persuaded her mother to come live with her in China. Five of Wood's six children have emigrated to the US, and she visits them for a few months every few years. The woman from Arkansas moved to China a year after she married her veterinarian husband Huang Yuanbo at age 20. She was surprised by what she saw upon arrival. It differed from what she had imagined since age 13, when she read Young Fu of the Upper Yangtze - a novel about a young boy in what is today's Chongqing municipality. "I'd expected people in colorful clothes, and they were actually all blue and black," Wood says, laughing. She recalls the excitement of being among the few foreigners to witness New China's founding in 1949. "Tailor shops and everybody with a sewing machine were making red flags, often working through the night," Wood recalls. "I was worried I might not get one, because everyone wanted them." She got hers from a local women's association on the eve of the People's Republic's birth and has hung it outside every National Day since. "It should have its day out in the sun," she says. "It's more than 60 years old now." In 1975, Wood became a citizen of the country whose founding she witnessed, thanks to a written order by former premier Zhou Enlai. "I was very happy to be part of the Chinese people," she says. "After living here for so long, I no longer feel like an outsider."